The Automatic rotary volumetric filling & sealing machine is a combination of rotary type volumetric filling and ROPP / screw cap sealing arrangement of glass, PET or HDPE bottles. 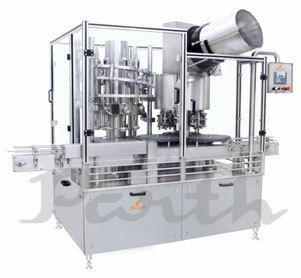 Parth Engineers & Consultant offers different variants of these machines. We supply Rotary volumetric bottle liquid filling and ROPP machine- Monoblock 20X12, 16X12, 8X8 and Rotary volumetric bottle liquid filling and ROPP or screw capping machine- Monoblock 12X8, 6X6. The design parameters are in line with higher production rates. The raw materials used are industrially graded ones giving the machine a sturdy built. The filling and capping machines are made compact and given a matt finish thus giving it a tidy look and increased durability.